It has been months since the last osPID kits went out the door. We have been working hard to make the necessary changes to the design in order to adapt it to automated factory assembly. We went through several assembler companies abroad and local in the process. 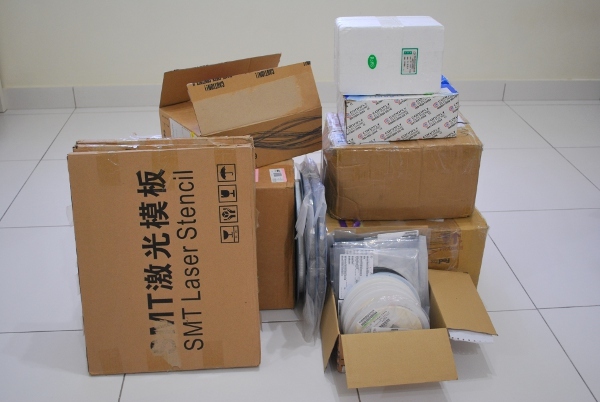 Getting the units assembled in China seemed to be the obvious choice initially, but we had tonnes of parts which we had bought earlier for the 1st batch of osPID Kit. In terms of logistics (and duties,) it is not wise to ship 10 kg of parts into China then have them shipped right back (an osPID Kit weighs about 0.25 kg!!!). We decided to get them assembled locally here in Malaysia. It was initially decided that we get them assembled somewhere nearby (2 km away!) so we would be able to monitor the process closely. But, after a couple visits to the factory that includes all the technical portions, the factory sales guy seemed reluctant to do our small volume production. We guess they wanted to stick to their high volume assembly jobs instead. To be honest, we wasted a lot time here and their assembly cost was not that cost effective either. On the plus side, it was awesome to see lines and lines of huge Juki pick and place machines doing their thing! Anyway, we were lucky enough to stumble upon an assembly factory located in North of Malaysia that was kind enough to accept our small volume production (anything that is less than 5000 units is considered small volume). In addition, their assembly cost is much more affordable. This allows us to keep the osPID Kit price as it is for now (we had to manually assembled them for the 1st batch!) as the assembly cost was not present in the 1st batch. We also did some optimization to the BOM price to squeeze in these additional assembly costs. At this moment of writing, we have all the parts ready for assembly (total weight of nearly 30 kg!). Here’s a picture of stash of osPID components! We painstakingly tested all 500 buzzers to make sure no faulty ones are being fitted to the boards. The sound of buzzer is still ringing in our ears! We’ll be heading 500 km North of Kuala Lumpur to get these babies assembled. If time permits, we’ll do a short video on the assembly process. It should take about a week for them to complete them (it only takes a day actually for complete assembly but setup takes some time and we have to fit into their existing schedule too). Back orders of the osPID Kit is now opened but will not shipped for at least another week or two. We hope more people will get their hands on the osPID Kit this time around. Happy tinkering & take care!